I grow a lot of pumpkins and so at this time of year we we eat a lot of roast pumpkin, pumpkin mash (about 30% potato to 70% pumpkin to is optimal) & Paula makes great pumpkin soup. But pumpkin pie is something we have tried to make from time to time using various recipes - my attempts have been recipes that included egg and evaporated carnation milk included in the filling, Some of these attempts have been OKish but generally not quite what pumpkins are for. I have also eaten pumpkin pie out but not been that impressed. All change with this attempt! 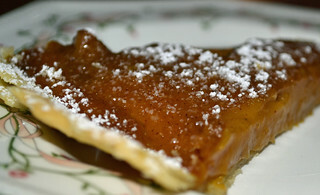 This was the best pumpkin pie we have ever made in our family - made by Melissa - a vegan version of Pumpkin pie. I am now a convert to Pumpkin pie! The recipe uses tinned pumpkin but Melissa substituted slow roast pumpkin from our garden. Melissa doubled the quantities given in the recipe and used this quantity to make both a thin pie and a "deep pan" version.